Sheridan students began voting online and at all three campuses on the Transit Referendum. Voting began on Nov. 26 at 9 a.m. and will continue until 7 p.m. on Nov. 30. Students can vote online by going to theSSU.ca and clicking “Vote Now”. Voting online is very easy, it can be done anywhere at any time. 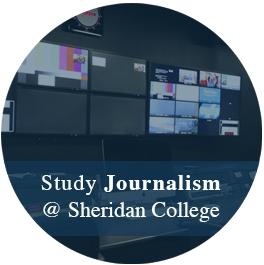 Full-time students can login using their Sheridan username and password. The page will tell you about the ancillary fee that would be added as a result of the U-Pass and ask if the U-Pass “is right for you”. Students choose yes or no and the vote will be recorded immediately. Students can also vote in person at the voting stations available at all three campuses. At Trafalgar and Davis Campuses voting stations are at Student Centre/Union Square. At HMC voting is on the second floor in B-Wing next to Creative Campus Galleries. The in person voting station will be running from Monday-Thursday from 9 a.m. to 7 p.m. and 9 a.m. to 3 p.m. on Friday. SSU representatives at the booth are available to help students vote. Voting station at Union Square at Trafalgar Campus. 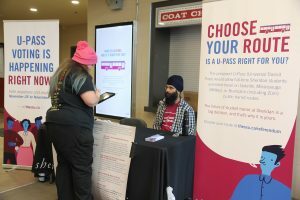 The vote is for Sheridan students to decide whether a Universal bus pass (U-Pass) is better than the existing shuttle services the college offers. 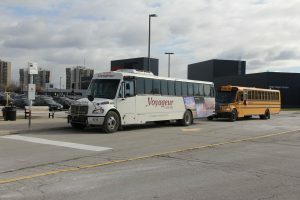 Sheridan’s Inter-Campus shuttle bus at Trafalgar Campus. The Inter-Campus shuttle is a bus service that runs between all three campuses — Monday to Friday from 6:30 a.m. to 11:30 p.m. Students can use the shuttle at any time by showing their Sheridan OneCard when boarding the bus. If the U-Pass gets majority of votes then it will go into effect on Sept. 1 replacing the inter-campus shuttle services. 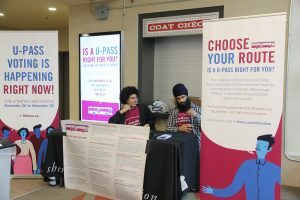 For more information regarding the U-Pass and the implications it would have, check out the Sheridan Sun’s everything you need to know about the U-pass. Laura DiViesti, special projects coordinator for the SSU, says “We are already getting close to that 15 per cent we need.” Over 3,000 students have voted so far and the voting count is available on the SSU website, which is being updated a few times a day. “For our referendum to be binding, we are required to have at least 15 per cent of eligible voters cast a ballot. In this case, that means 15 per cent of full-time students, as defined by their program, must vote for the decision to be binding. With that, we will be releasing final voter counts alongside the results on Monday, Dec. 3 via our website and social media,” DiViesti says.